Dubya: Fool me once, shame on you! Ya can't get fooled again! I came to this short film with absolutely no clue as to its content – not the theme, not the genre, not even if it was an animation or not. The opening of the film sees a George Bush figure in a dunce cap in a classroom – (which is unmistakably "that" classroom) and we hear one of his Bushisms played as he tap dances and entertains. At this point I thought this would be a lazy piece mocking Bush since this is how it had looked to me at first glance. This impression lasted seconds though as I was thrown into an 8 minute ride of symbolism, challenging images and chaos on my way to a feeling of "what the hell did I just watch". And I'm sure I'm not alone. The good thing is that you will jump right back into this film – not to try to figure it out, but rather to figure out how it makes you feel and why. 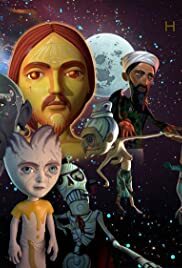 With 9/11 imagery, politicians as entertainers/distracters for children, Bin Laden and an army of humanoid bombs, Al Qaeda as a wing of the CIA, religious figures and deities, humans suffering under control of TV screens directly plugged into their brains and lots of Illuminati symbols, this is a short film that has much more in it than the simple title suggests. The best way to watch is to try to set aside your views on such things as Illuminati, religion and politics and let the film have its time because even in terms of "spot the reference", this is something you'll want to watch again. To give examples – your eye will go to Bin Laden on a boat sailing against America and instinctively it made me feel uncomfortable that he would be shown in this way – on second viewings I saw the human weapons behind him but also the CIA badge on his jacket. Likewise even on the opening scenes it is worth pausing and looking around behind the Bush caricature to see the detail of an "evolution" chart which is the norm is schools but this one seems to contain an "enlightenment" stage, while on the blackboard the children appear to be playing hangman with the word evolution being spelt out. Heck it even took me a while to spot that the goat in the opening few second was not a production company logo as I first thought, but actually in a detainment camp, boxed up, with a bar code on its forehead, and of course the title is a reference to the children's book that Bush was reading while planes flew into the towers in New York on 11th September. Even with slower viewings there is so much in this short film to catch that I know most of it still went over my head. Whether you agree with the material or just laugh at it for its conspiracy theory nuttery, it has to be applauded for the construct and the detail; after all, Pixar put some background pop culture references in their films and everyone is falling over themselves with praise, so this short deserves the same. It is worth saying that animation is also beautiful – polished, professional and full of small detail. Content wise it may well be an old man on the bus babbling about lizards and third eyes, but it is fascinating and beautiful to watch. Personally I thought some of the ideas within the film were nonsense (but then, I'm a goat in a box, so what do I know) and some of the images and themes made me feel uncomfortable with their use, but this is fine – it is good to have a short that grabs you, overwhelms, challenges and makes you think – even if the outcome of those thoughts might be "yeah...but no".